At 740 Park Plastic Surgery, our board certified plastic surgeons offer tummy tuck surgery (abdominoplasty) to tighten loose/stretched abdominal muscles, excise extra skin, and pull the remaining skin taut for a firmer, more toned midsection. Additionally, liposuction can also be performed to remove undesired fat, further enhancing the treatment area. By utilizing innovative surgical techniques, Dr. Daniel Y. Maman and Dr. Stafford R. Broumand can help you achieve a rejuvenated figure with beautiful, natural-looking results. In addition to these qualifications, candidates for tummy tuck surgery should be relatively healthy (no unmanaged medical risks), at or very near their desired weight, and have realistic expectations for the procedure. Those who smoke and/or use tobacco products must quit at least two weeks before surgery, and they should have no intention of resuming these habits afterward. During your consultation, all of these candidacy requirements will be discussed in full detail to determine if abdominoplasty is the right treatment for you at this time. There is a variety of elements that factor into attaining an ideal abdominoplasty outcome. Below are a few key details to consider prior to pursuing tummy tuck surgery. While both abdominoplasty and liposuction can be used to effectively achieve a more toned and contoured appearance in the abdominal region, the most appropriate technique will depend on the patient’s unique indications. In general, liposuction can improve the form of the abdomen, but it will not alleviate excess skin or disruption of the abdominal muscles. As a result, it is typically a better method for targeting specific areas of fullness in individuals whose concerns are limited to excess accumulations of fatty tissue. In contrast, a tummy tuck can tighten lax muscles of the abdominal wall and eliminate extra skin in the stomach region. For this reason, tummy tuck surgery is often the best option for women whose abdominal skin and muscle tissues have stretched during pregnancy, as well as for both men and women who have undergone significant weight fluctuations that have led to redundant skin and loose abdominal muscles. Should excess fat also accompany these concerns, liposuction can usually be employed during an abdominoplasty to help further shape and refine the hips and abdomen. Following a thorough evaluation of your specific needs and desires, one of our doctors will be able to recommend the most appropriate option (or combination of methods) for you. The key distinction between a full and mini tummy tuck is the length of the incision. For a traditional full abdominoplasty, the incision generally spans from hip to hip across the lower abdomen. Contrarily, the incision for a traditional mini abdominoplasty is shorter in length, typically resembling the size of a C-section scar. In many practices, a full abdominoplasty is performed for individuals who have a significant amount of excess skin and fat with relatively poor skin elasticity, while a mini tummy tuck is reserved for those who are thinner and more fit with good skin elasticity. At 740 Park Plastic Surgery, however, our doctors often employ a modified approach that blends the two tummy tuck methods, offering patients the respective advantages of both techniques—a comprehensive enhancement achieved with as minimal scarring and downtime as possible. If you anticipate having one or more children at some point in the future, Dr. Broumand and Dr. Maman usually suggest waiting to undergo tummy tuck surgery until after you are done having kids. Reason being, the physical changes typically associated with pregnancy can often have a negative impact on the results of a previous abdominoplasty. For instance, many women experience re-stretching of abdominal skin and/or musculature during pregnancy, both of which may not return to their pre-pregnancy state despite a nutritious diet and regular exercise. In several cases, this leads to the need and/or desire for another abdominoplasty procedure to restore the previous outcome. 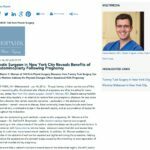 That said, if you are not sure if you are going to have children in the near future, a tummy tuck can certainly still be performed—there is no reason to live many years with a weakened abdominal wall and loose, excess skin based solely on the chance you may have kids sometime down the road. If you do choose to have an abdominoplasty and subsequently become pregnant, there is a possibility that a secondary operation will not even be necessary. Everything depends on the physical changes you experience, how your body reacts to these changes, and whether or not you are happy with your post-pregnancy figure. In the end, the right timing for tummy tuck surgery is unique to every person. During a consultation at our practice, you can discuss your current aesthetic needs and any future plans you may have in regard to starting (or growing) a family, and together you and your surgeon can decide when the most appropriate time to undergo surgery may be. As with any surgical procedure, some degree of scarring is unavoidable following abdominoplasty. The length and width of your tummy tuck scar will depend on how much skin is removed, as well as how closely scar management directions are followed after surgery. The good news is, the abdominoplasty incision is made along the lower abdomen, enabling it to remain concealed underneath most bathing suit and underwear varieties. What Is the Tummy Tuck Consultation Like? To begin the abdominoplasty consultation, your plastic surgeon will carefully listen to your cosmetic desires and perform a physical evaluation to ensure tummy tuck surgery can effectively achieve your goals. Next, he will review your medical, family, and surgical history in full detail to make sure he has a full understanding of the complete picture. Due to the careful thought and planning involved in aesthetic surgery, it is imperative that your doctor comprehensively grasps your motivation for pursuing abdominoplasty. Once your plastic surgeon has a clear picture of your desired result, he will continue by outlining a personalized procedural plan based on your specific needs and anatomy. He will also help you visualize attainable goals and realistic expectations using VECTRA® XT 3D imaging—an innovative technology that enables ultra-high resolution digital images taken of your own body to be modified based on the proposed treatment plan. This provides an excellent opportunity to ensure you and your doctor are on the exact same page in regard to expected results. Throughout the entire consultation process, Dr. Maman and Dr. Broumand encourage you to ask any questions or express any concerns that come to mind. Strong communication is essential to achieving an optimal outcome, and an open dialogue starting from day one helps lead to higher patient satisfaction in the end. When you arrive on the day of your surgery, you will be greeted warmly by our staff and introduced to the members our operating room team, several of whom have worked with our doctors for over two decades. Next, your plastic surgeon and our staff will walk you through the pre-operative process and guide you to the operating room where you will change into surgical garments, sign preoperative paperwork, and confirm that everything is set to proceed. Every effort will be made to ensure you feel as relaxed and comfortable as possible leading up to the time of your surgery. Custom-tailored for each patient, the abdominoplasty technique Dr. Broumand and Dr. Maman typically employ is a modified approach that blends the respective advantages of mini and full tummy tuck methods. During the procedure, an incision is first made as inconspicuously as possible along the lower abdomen. Through this incision, abdominal muscles spanning from the pubic region up to the ribcage are gently tightened, and excess skin is removed. Remaining skin is then pulled tight and secured for smoother, firmer aesthetic. If needed and/or desired, liposuction can also be performed to eliminate localized fat buildups in the midsection, and the belly button can either be preserved or relocated for an optimal result. The abdominoplasty procedure is conducted under general anesthesia and generally takes approximately two hours to complete, though this will ultimately depend on the individual’s specific needs and cosmetic desires. Following treatment, you will awake feeling as if you have just taken a restful nap. Our operating room team (along with our board-certified anesthesiologist) will be present to greet you, and they will help you walk under your own power to the recovery room, ensuring that you are in no pain. After about an hour in this recovery room, a staff member will evaluate your condition to make sure you feel well enough to return home. If so, they will contact a close friend or relative to have you picked up and taken back to your house that day. Some minor swelling and/or bruising can often be expected following tummy tuck surgery, but these side effects should gradually subside over time. At our practice, Dr. Maman and Dr. Broumand generally use a 72-hour anesthetic known as EXPAREL® in combination with the abdominoplasty procedure to help minimize any pain that may be experienced in the first few postoperative days. After this time, any discomfort—though rare—can typically be managed with medication. The majority of individuals feel well enough to return to non-strenuous work and regular daily routines after about seven days, but it is advised that strenuous activities and vigorous exercise be avoided for a minimum of one month, as any action that places strain on the abdomen during this time may negatively affect proper healing. Once the swelling from surgery has dissipated, patients should begin to notice the full effects of the procedure—a smoother, flatter-looking abdomen. Our plastic surgeons believe patient education is essential to achieving the best tummy tuck results possible. During the consultation process, your surgeon will provide a comprehensive overview of the procedural process, including what to expect before, during, and after surgery. If at any point in time you have a question or concern, they will encourage you to speak up so you can gain a better understanding of the treatment and make a more informed decision about your cosmetic options. The entire 740 Park Plastic surgery team is aware of how much information there is to take in all at once, and we are happy to give you the time needed to digest every detail at your own pace. The choice to receive a tummy tuck is solely yours, and it should be made only when you are ready. To learn more about abdominoplasty, or if you wish to schedule a consultation with one of our Harvard-trained doctors, please contact 740 Park Plastic Surgery today.